Board members of the newly formed Abyssinian Fund and president of the organization, Rev. 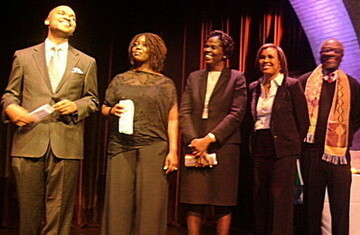 Nicholas S. Richards, (far left), at a reception held on Friday, December 4th, 2009 at the Harlem Stage. (Tadias photo). New York (Tadias) – This past weekend we attended the launching of Abyssinian Fund, an NGO dedicated to fighting poverty in Ethiopia. The event was organized in Harlem by members of the legendary Abyssinian Baptist Church and was held on Friday, December 4th, 2009 at the elegant Harlem Stage. The reception attracted local politicians, business leaders, and diplomats, including representatives of Ethiopia’s Permanent Mission to the United Nations. The evening also showcased an exhibition of recent images of Ethiopia by Photojournalist Robert E. Eilets. The photographs were auctioned and helped to raise $2,500 for the new organization. According Reverend Dr. Calvin O. Butts, III, the church’s current pastor – who made a brief introductory remark at the VIP reception – the project was born out of the group’s historic trip to Ethiopia two years ago. 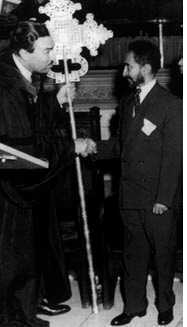 The pastor, who led over 150 delegates to Ethiopia as part of the church’s bicentennial celebration and in honor of the Ethiopian Millennium, told the crowed that the journey rekindled a long but dormant relationship that was last sealed in 1954 with an exquisite Ethiopian cross, a gift from the late Ethiopian Emperor Haile Selassie to the people of Harlem as a symbol of love and gratitude for their support and friendship during Mussolini’s invasion of Ethiopia. The cross has since become the official symbol of the church. According to the church’s official history, in 1808, after refusing to participate in segregated worship services in lower Manhattan, a group of free African Americans and Ethiopian sea merchants formed their own church on Worth Street, naming it the Abyssinian Baptist Church in honor of Abyssinia, the former name of Ethiopia.